Marine Carbohydrates: Fundamentals and Applications brings together the diverse range of research in this important area which leads to clinical and industrialized products. 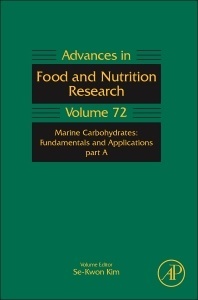 The volume, number 72, focuses on marine carbohydrates in isolation, biological, and biomedical applications and provides the latest trends and developments on marine carbohydrates. Advances in Food and Nutrition Research recognizes the integral relationship between the food and nutritional sciences and brings together outstanding and comprehensive reviews that highlight this relationship. Volumes provide those in academia and industry with the latest information on emerging research in these constantly evolving sciences. Experts as well as novices in the field of marine biology, students, scholars, scientists and industrialists in the field of marine biology.